Facet joint syndrome is a painful back condition that involves the tiny joints along the posterior spine. This condition is often difficult to treat, but pain management specialist often treat it with facet joint injections (FJIs). The facet joints are tiny areas of connections between the vertebrae of the spine. The nerve roots pass through these joints to go from the spinal cord to the legs, arms, and other parts of the body. These joints allow the spine to bend and twist, keeping the back from slipping too far forward, or from twisting without limits. Each facet joint has a small amount of cartilage that allows some movement where two bones joint. Lined with synovium, the facet joints also produce a tiny amount of synovial joint fluid. What causes pain of the facet joints? 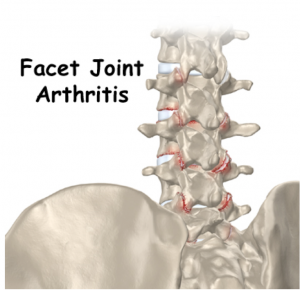 When the facet joints become swollen due to arthritis or injury, it produces pain. The affect joint may be in the neck, producing headache or neck pain. If the affected facet joint is in the lower back, it can produce pain that radiates into the buttocks or thighs. People with facet joint syndrome complain that they have to turn their entire body to look to the right or left. The condition leads to pain and stiffness, and it can make it hard to stand up straight or get up from a sitting position. The symptoms depend on which joint or joints is/are affected. When a facet joint becomes enlarged and gets swollen, it may block nerve root passage, causing compression (pinched nerve). This condition is known as facet hypertrophy, and it can lead to radiating pain down an arm or leg. The main choice for treatment of facet joint syndrome involves conservative measures, such as anti-inflammatory drugs and physical therapy. These therapies offer immediate some relief of pain, but the pain relief may be short lived. 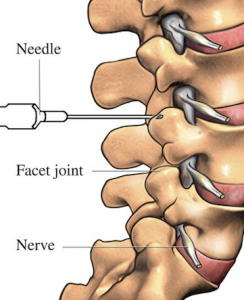 For better pain relief, the doctor may recommend a series of facet joint injections. This involves inserting a small needle into the joint using x-ray guidance for correct probe placement. A corticosteroid and anesthetic agent are injected onto the nerves, and the needle is removed. How long do FJIs last for pain relief? After a facet joint injection, expect to be pain-free for 1-10 days. The doctor may schedule a series of three injections, scheduled 2-4 weeks apart. The series offers pain relief for around 3-6 months. What other procedure can be done for facet joint syndrome? If the pain associated with the facet joints continues, the pain management specialist may recommend a facet rhizotomy. This involves use of radiofrequency energy to destroy a portion of the nerve inside the joint. This offers long-term pain relief, which could last for up to 12 months. What type of surgery is used to treat facet joint pain? Surgery for facet joint syndrome is considered when the condition does not improve after 6-8 weeks of conservative treatment. Open spinal fusion is performed under general anesthesia, and it involves a long recovery period (3-6 months) with physical therapy. The doctor may perform an endoscopic rhizotomy, which involves using a tiny camera to visualize inside the joint. This requires only a tiny 7 millimeter incision, and recovery is not as detailed as with spinal fusion. Dr. Ajay Yeddu is a top pain management doctor in Gilbert AZ and offers comprehensive pain treatments including facet injections, epidural steroid injections, radiofrequency ablation, spinal cord stimulator implants and more! Most insurance is accepted, call today. Hestbaek L. et Al., The clinical aspects of the acute facet syndrome: results from a structured discussion among European chiropractors. Chiropractic & Osteo. van Kleef M. et Al., Pain Originating from the Lumbar Facet Joints. Evidence based medicine, World Institute of Pain, Pain Practice, Volume 10, Issue 5,p 459–469, 2010.